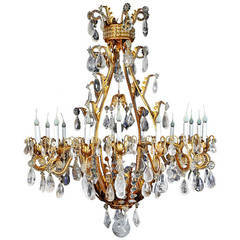 A wonderful Baguès style French rock crystal and flower crystals throughout with a gold gilt patina, over an eight-light iron bird cage form chandelier. 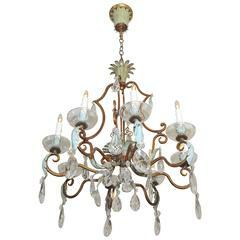 Completely rewired and ready to install with chain and canopy. 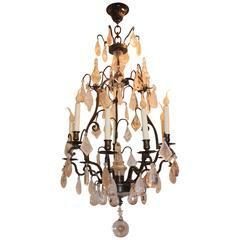 A wonderful Baguès French rock crystal and gold gilt iron chandelier ten-light chandelier completely rewired and ready to install with chain and canopy. 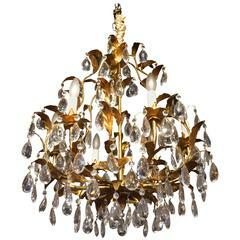 A wonderful French gold gilt and alternating rock crystal bird cage form, center flower bouquet chandelier in the manner of Baguès. 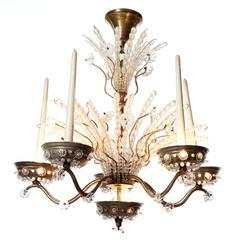 Medium scale French Baguès style six-light chandelier with gilt metal stem and leaf structure and cut crystals. 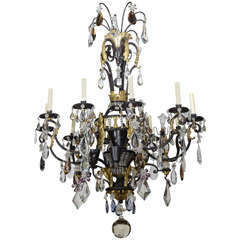 A monumental and large Bagues style gilt metal and cut rock crystal multi-light chandelier.